Colclough Bone China was founded in 1890 in Staffordshire, England 1890 by Herbert J. Colclough. Ex-Mayor of Stoke-on-Trent. Herbert was a china lover, workaholic and man of the people. He was the man to bring fine bone china to the ordinary people. Mayor Colclough first came into my radar in the 1960's. My mother had brought home her very own fine bone china tea set. Something she had always desired. It was her pride and joy - only to be used on Sundays and when the Vicar dropped by. More of Herbert Colclough's story further down this page, but for those who are looking to get an idea of value, let's look at the price guide. Today, the main market for Colclough China is on eBay - where there is a quite active market. You can get some genuine bargains, but if you are selling and you know how to present the wares, you can get good prices. 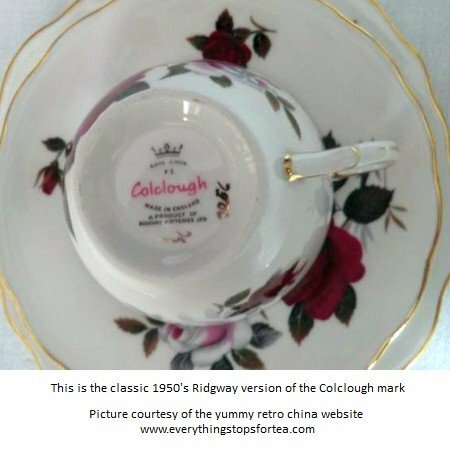 Colclough was both hard working and driven – a powerful combination that worked together in the formation 'The Colclough China Company'. His vision for his beloved Colclough Bone China company was to get royal patronage which he succeeded in doing in 1913 when he was bestowed a royal license for his Vale China by King George 1V. 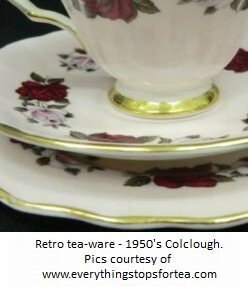 Colclough went on to innovate the production of fine bone china for the mass market in the 1930’s which makes Colclough an important part of antique bone china history. It also makes him very popular in my own heart because, as I mentioned above, Colclough’s ‘Amoretta’ pattern set was the pattern my parents bought and displayed proudly as their BEST china. They were so proud and protective of it! But tea did taste nicer from those thin lipped translucent porcelain cups. The set would only come out on special occasions and the occasional Sunday tea. Ok, it wasn’t Aynsley or Royal Albert, but to my mother it was her pride and joy. To their dying day, my parents still kept their Colclough bone china tea set in the family sideboard convinced of its antique bone china status. Colclough's big idea was for the less well-off to be able to buy part sets or individual pieces without having to commission a whole expensive set, as the aristocracy and well-to-do were accustomed to doing. Of course this was the right idea at the right time and it truly worked. Thank you Mayor Colclough! Colcloughs, the company, having merged with Booths, then bought the Ridgway brand (a maker of past repute and royal patronage – see my A-Z Guide. This important group became amalgamated with the Royal Doulton brand in the early 1970's. 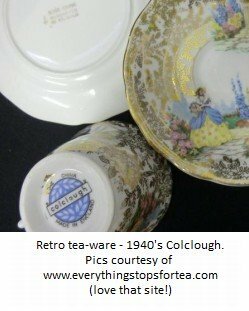 In 1996, all Colclough production was discontinued, and later Doulton itself, together with all its associated brands, was merged with Wedgwood. As well as Royal Vale, china names associated with Ridgway and Colclough are Royal Stanley and Royal Adderley.